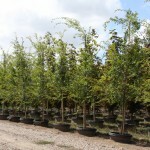 An upright spreading tree with an outline similar to that of the American Elm. 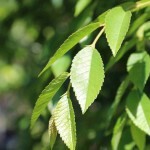 It is very resistant to Dutch Elm disease and elm leaf beetle. The bark exfoliates in puzzle-like patches, exposing various shades of gray, green and orange-brown. The glossy green summer foliage turns to soft yellow and orange in the fall. It grows best in full sun with a well-drained soil, and adapts to light shade and wet and dry sites. It is generally tolerant of urban conditions.